Anonymous devotee of Shirdi Sai from US says: Sairam Devotees! Sai, Let me perform this duty of writing this experience as Your work, being Your instrument, to the best of my ability and offer it at Your lotus feet. Sai, please be the thinker of my thoughts, speaker of my words and doer of my deeds. Please help me accomplish this task. Devotees, I am also a part of this Mahaparayan group. With Baba's grace, everything is going fine. Last week I completed my Mahaparayan on Thursday. I live in US and its one of the bigger cities. Parking is a problem here; therefore, we parked our car in the street. Unfortunately, that night one of the SUV hit our car and ran away. The car was totally damaged. We did all the procedures through police and insurance company. The car was taken for repair in an auto shop. We are new to this country and this car was our first car. We had bought it through hard work. We just had completed the payment of this car. This damage became a huge problem for us. We were unable to decide what to do and what not to do. Some of our friends/relatives suggested to use the repaired car and some said it would be a risk. This all created lot of confusion. I could do nothing except praying to Baba and surrendered at His feet. I prayed to Baba to do whatever was good for us. We humans do not know what is good/bad, so please decide for us. I said to Baba that things should go as per His decision. I did not want to think/analyse because everything is under His control and He alone knows what is best for us. Baba listened to my prayers and with Baba's grace insurance company settled the amount in our favour. It was a sad situation to lose a car, but, Baba solved our issue. Yesterday, because of Baba's blessings, we were able to get a new car. This new car is expensive/branded and this is above our level. I take it as Baba's gift and I am sure Baba will take care of it. Sai will help us to pay the amount someday. With Baba's grace, all these issue was solved within 4 days. I thank You Sai for taking care of everything. Sai, please bestow Your blessings on all of us. We are nothing without You. You are our everything. Devotees, whatever challenge comes, let us use the Sai's strength that is within us, let us surrender to His feet, and let us wait with faith and patience. 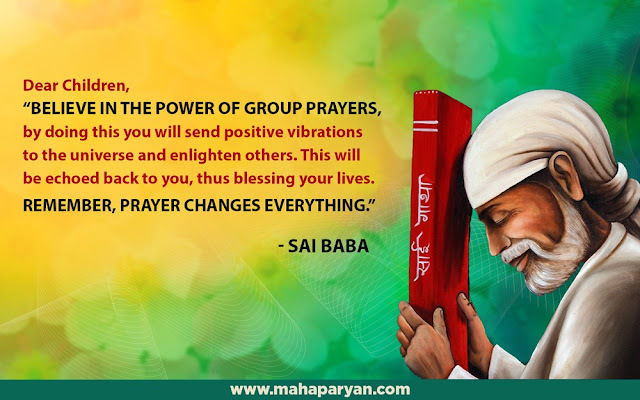 When Baba has chosen us as His devotees, time has come when we have to interlock our life with His teachings. Thank You Sai for being with me. When Baba is there at every step why should we worry or have any fear? He knows what is best for His children and like a loving merciful mother will give only what He feels is good for His children no matter what the children ask for. Love You Sai. Jai Jai Ho Sai.